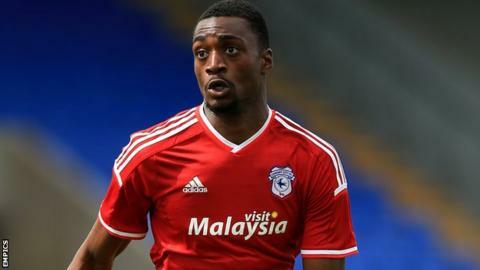 League Two side AFC Wimbledon have signed Cardiff City defender Semi Ajayi on a one-month loan deal. The 21-year-old has not featured since joining the Bluebirds from Premier League side Arsenal this summer. Centre-back Ajayi, who is a Nigeria Under-21 international, is eligible to make his debut for the Dons in Tuesday's game at home to Northampton. "We tracked Semi when he was at Arsenal and we wanted more competition," Dons boss Neal Ardley told the club website. Ardley's move for Ajayi comes after Wimbledon centre-back Will Nightingale was ruled out for the rest of the season with a serious knee injury. The 20-year-old sustained a cartilage tear in the win over Notts County and, following surgery, is expected to be out for around seven months. "Our heart goes out to Will because he has had a lot of bad luck," Ardley said. "We have rallied around him. He has a long road to recovery now, but we will be here for him." Nightingale has made five appearances for the League Two side this season.